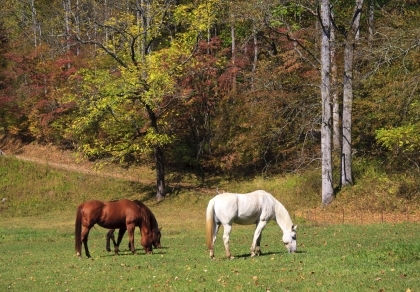 Cases of laminitis and colic often increase during Fall, especially for those horses grazing on pasture. In fact, the increased sugars in grass caused by new growth and cooler night time temperatures, plus the increase in the horse’s blood ACTH (adrenocorticotropic hormone) secretion from the pituitary gland can compound to make this a risky season especially for those horses prone to laminitis. Insulin resistant (IR) and Cushings horses are especially at risk, but any horse can be impacted by these changes. The horse often does not produce enough digestive enzymes needed for the increased and fluctuating fructan (sugars) levels in the small intestine (foregut), thus creating a scenario for the destructive outcome of laminitis.These shifts in sugars (carbohydrates/fructans) in grasses can also produce gastrointestinal upset such as gassiness and diarrhea in any horse. It is believed that grasses increased levels of sugars due to cooler nights help the grass survive but can create havoc with the horse’s micro-organisms in the hind gut. How can Yea-Sacc reduce the risk? Yea-Sacc is a live yeast culture that can help reduce the risk of horse colic, gas, and laminitis by helping prevent the acidic conditions that Fall grass can cause in the digestive system. It stabilizes the gut pH so that the beneficial bacteria can cope better with dietary changes.